If we were to do a time capsule, what are some of the things that would represent us best? What would we like to save for 25 years and revel in the world again? Trends come and go and some of them never come back (hopefully). Others, seem to always resurrect, like Converse. Others die and most people don’t seem to even remember them like the Kylie Jenner lip challenge. Music changes and evolves as time passes and so do many other things like video games, tech gadgets and even lingo. Just imagine all the iPhones we have gone through in the past 20 years. From the very first ones to the 4, 4s, 5, 5s, 5c, 6, 6s, 7, 8, and the X. Then, we have fidget spinners, and somehow we should definitely include how games have evolved, from Minecraft to Fortnite. Other trends we should include in our time capsule are snap spectacles, a Mac Miller CD, and maybe a pair of high-waisted jeans since those seem to be back again. What else would you like to include in our time capsule? Celebrating 150 Years of MSU: What It Means for You! Minnesota State is set to celebrate a major milestone in 2018 as it will celebrate its 150th birthday. Founded on Oct. 7, 1868, MSU is Minnesota’s third oldest university behind Winona State University (1858) and the University of Minnesota (1851). MSU has been celebrating over the last year and it will cap off the celebrations with homecoming and a few other events in the coming weeks. The full schedule of events for the 150th Celebration Week, courtesy of Paul Hustoles. Celebration events include the “Stomping Through the Decades” Homecoming Parade, several presentations, dedications to MSU buildings, speakers and more. Saturday, Oct. 6 marks the finale of the celebration and will be the Birthday Bash party in the CSU. Hustoles said the event is free to “every member of our MSU community” and more details regarding the event should be available soon. He also stressed the importance of celebrating the university’s milestone. “Current students will forever be part of our history. [There’s] no time like the present to celebrate our collective past and our anticipated future,” he said. 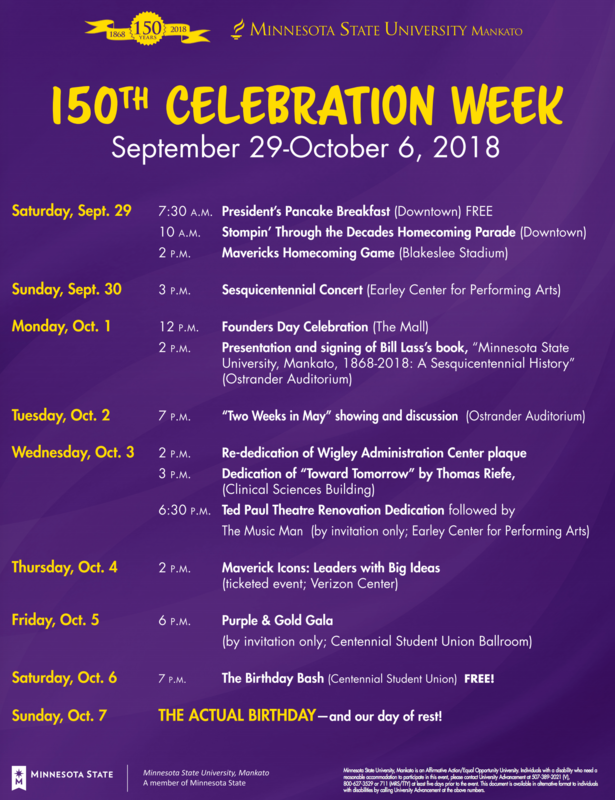 For more information about MSU’s 150th Observance, please contact Paul Hustoles at paul.hustoles@mnsu.edu or visit www.mnsu.edu/150/. Homecoming weekend is usually one of students’ favorite events of the year and that’s largely due to the exciting events that take place. You’ve probably seen the event names all over the place, but what exactly should you expect? Luckily for you, this is my fifth homecoming, so I’m here to provide you with a little rundown of the week’s remaining events. By far one of my favorite events of the year. During the last two or three weeks, RSOs have formed teams and have been practicing a full-blown dance routine. The routines usually last five to six minutes and include props, flips, lifts, one person always lip syncing and much more. Thursday at 7 p.m. in Bresnan Arena, the teams perform their routines live in front of a panel of judges and students and are scored on certain criteria including, but not limited to, originality, creativity and incorporating the homecoming theme. After each of the teams has performed its routine, the Student Events Team reveals the MSU Homecoming Royalty. Two people are crowned and win based on interviews and votes from MSU students. Following that, the judges announce the winners of the Lip Sync competition. The atmosphere of this event is electric and the performers always put on dazzling routines. If you only make it to one event this weekend, make sure it’s lip sync! Fetty Wap comes to Kato as one of the biggest names the campus has seen in recent memory. He’s sure to put on amazing show, which will begin with a performance from Silento. The concert is always packed, loud and exciting. Grab some friends and catch a one-of-a-kind concert in Myers Field House Friday at 7 p.m. This should be one of the best parades MSU has ever had. Saturday’s Stomping Through the Decades Parade will be downtown for the first time in years. 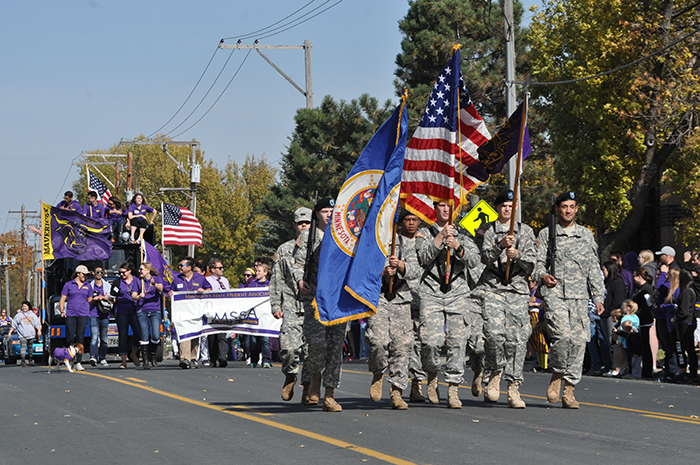 The parade, which begins at 10 a.m., is packed full of Maverick pride including royalty, handmade RSO floats, local law enforcement and fire vehicles, Maverick Machine pep band, city officials, academic clubs and many other entries. RSO’s compete by trying to create the best float and are again scored by a panel of judges. They go all out for these and often have jaw dropping setups as they stroll down the street. To find out more details and to find transportation information for the parade, check out last week’s article. The rival Huskies of St. Cloud State University come town for the Homecoming Finale. The Mavericks enter the weekend ranked as the #1 team in Division II setting the stage for a terrific matchup. Grab your friends, pack Blakeslee Stadium Saturday at 2 p.m. and cheer the Mavs to victory. 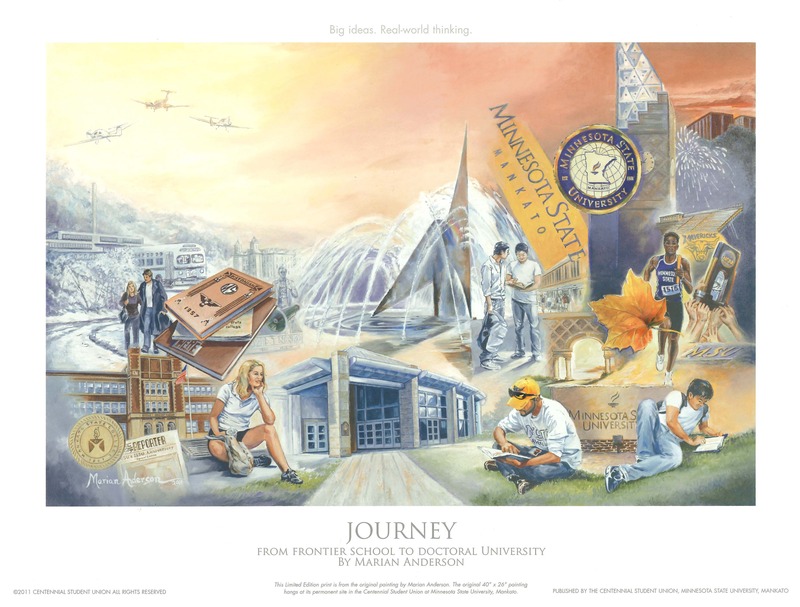 In honor of the 150th Anniversary of our school, I thought I would throw it back to the “Journey” painting in the CSU. I am sure many of you have noticed and walked by the beautiful painting by nationally renowned painter, Marian Anderson. Since it is such an iconic historical painting here at our school I’m going to give you some back story on the piece. The painting was created by Minnesota native, Marian Anderson, who said she had to experience and get a feeling of campus before she could paint it. Her vision for the piece came from enthusiasm shared by alumni and the campus community after a tour of campus. Anderson said her vision wasn’t about capturing a collection of campus buildings, but instead, about bringing pride and promise to the canvas. So now that you know the story behind “Journey,” I encourage you to take a closer look and be inspired. 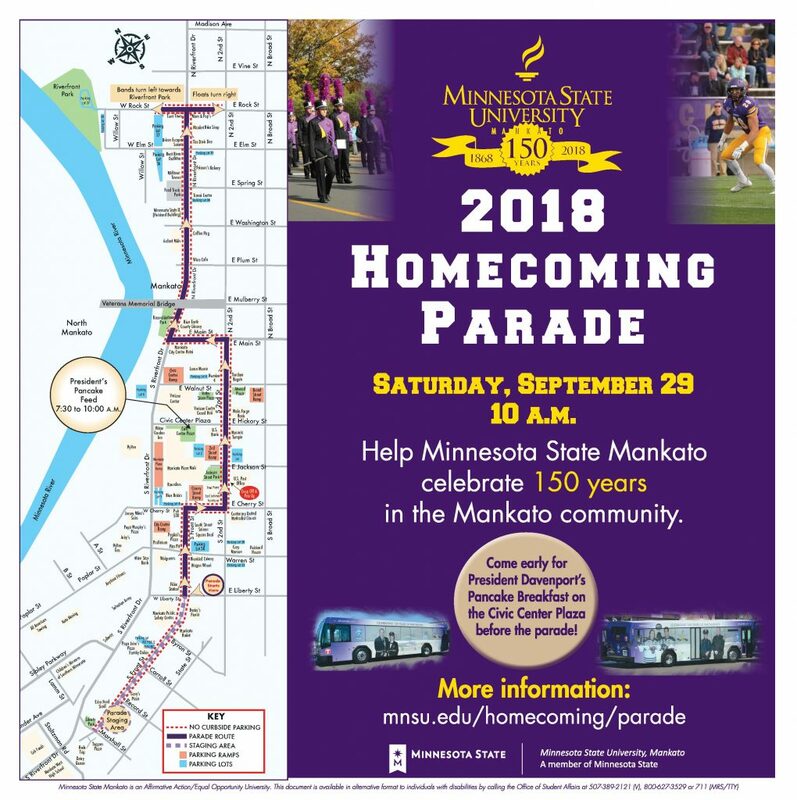 Greek Life, Coronation and the Homecoming Parade are all part of the spirit and tradition of college life at Minnesota State Mankato that build lifelong memories, friendships and the sense of Maverick Pride. 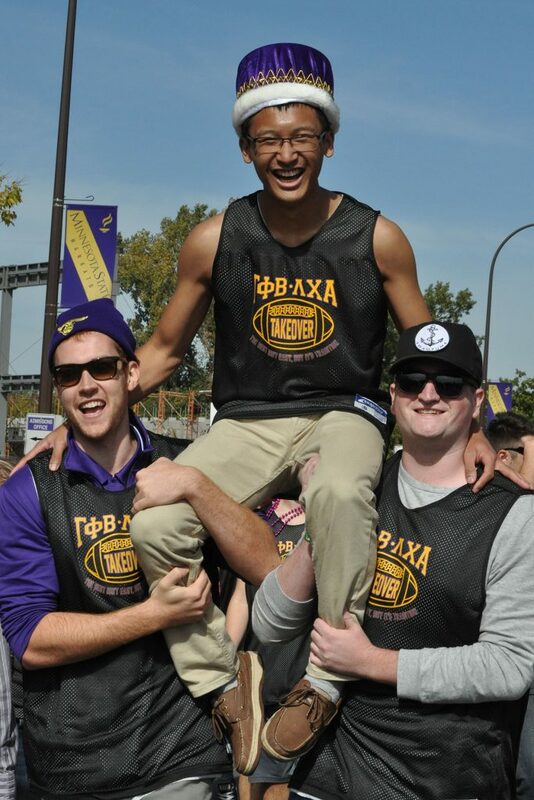 Creating memories on-campus is a vital part of the college experience. At Minnesota State Mankato there’s an activity or event for everyone. Whether you’re a new student or alumni, there are plenty of opportunities to meet new people, create memories and be a part of some memorable Minnesota State Mankato traditions. Sustaining and building upon those student-focused traditions rests with Brandon Weideman,2018-19 spirit and traditions chair on the Student Events Team. “We need traditions because they reinforce values and give students a sense of history and what came before them. They also provide students with something exciting they can look forward to year after year,” said Weideman. You may not have realized you’ve been a part of a tradition on Minnesota State Mankato’s campus, but if you’ve ever attended a homecoming football game, participated in the Maverick Day of Service, watched a movie at Stomper’s Cinema or attended a number of events and activities on-campus, you have been. “We are using these traditions to pass on the history and spirit of this university through the generations. So that when a graduate from 2018 talks to a graduate from 1988, they can both relate and talk about the same things they did in college and the fun they had because the traditions created a commonality between them and this wonderful University,” said Weideman. As with many traditions, the more things change – the more they stay the same. Current student may put a modern twist on time-tested event. Still, the memories remain basically the same between current students and alumni. It’s a bond that is shared and passed along as part of the Minnesota State Mankato college experience. “We maintain the energy around building a tradition by continuing to do it year after year, improving it and getting feedback, and then cementing the tradition in place,” said Weideman. Throughout the year, there are so many traditional events and activities on-campus that the university has created a bucket list of activities students MUST attend. If you’re interested in being a part of history go to: https://mankato.mnsu.edu/current-students/university-traditions/. Incoming and returning students are finding they can relieve stress on-campus in a way they never could have imagined. The therapists are the furry, four-legged kind that deliver a dose of kindness by just being dogs. Among those canines making a difference on campus is Willow, part of a dedicated effort on campus to offer therapy dogs to students. “We are always looking for new and creative ways to interact with students. Research shows animals can have a positive impact on reducing stress, anxiety etc. which are all things that come with the college experience,” said Student Relations Coordinator Gina Maahs-Zurbey. Zurbey was working in the Dean’s Office as a Student Relations Coordinator when she came up with the idea to incorporate a therapy dog into the office regularly throughout the semester. The process was long, but Zurbey worked hard to see her idea come to life. “All in all, it was about a year and a half in the making. Everything from the training, testing and working with MSU Administration to get Willow Wednesdays approved,” said Zurbey. Instead of advising students, Willow provides comfort to them. The 3-year-old Labradoodle receives visitors every Wednesday from 8:30 a.m. to 3 p.m. in her office located in Armstrong Hall, Room 226. She even has a plaque that says “Willow Room” right outside of her door. Anyone can simply as stop by the Dean’s Office in Armstrong Hall, room 226 and sign a liability waiver. After signing a waiver, students are encouraged to play, pet and even give Willow treats. If students ask nicely with please or pretty please she can perform a number of tricks from sit to speak. Students are encouraged to visit Willow every Wednesday from 8:30 a.m. to 3 p.m. If interested, students can contact Gina Maahs-Zurbey at gina.maahs-zurbey@mnsu.eduor drop by the advising office, Room 226 in Armstrong Hall to sign a liability waiver and meet Willow, the Labradoodle. For further questions, contact the Dean’s Office. Universities all across the United State use therapy dogs to encourage students to be more comfortable, healthy and stress free. At Minnesota State Mankato, a permanent therapy dog holds weekly sessions to heal students and faculty both mentally and physically. 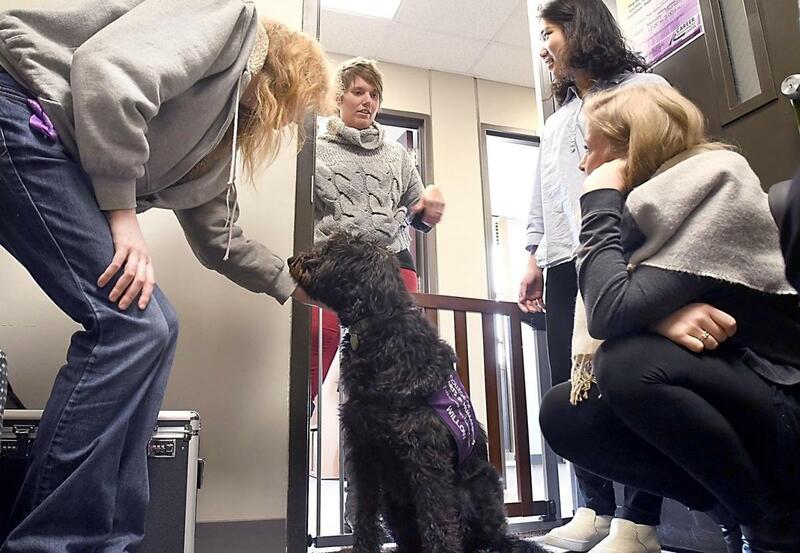 Additionally, the University hosts several events on-campus with therapy dogs, “Kanine Kisses and Hound Hugs,” which are held every third Thursday of the month in the Centennial Student Union in the Lincoln Lounge. There are several sessions held during both spring and fall final’s weeks on-campus. College students experience an overwhelming amount of stress during the school year. Whether it be volunteering, working, studying, or missing the comforts of home. Students need a heathy outlet to relieve their stress. Struggling? Check These Places Out! Students often deal with issues that vary from feeling too much pressure, stress and lack of sleep to depression, anxiety or family problems. The counseling center is here for all those needs and many more. They are confidential! Anything shared will stay confidential within the patient and the therapist. No one has access to it including, parents, coaches, and teachers. Students get up to ten confidential individual sessions per year. The center also offers group counseling and couples therapy and these do not count towards a student’s ten free sessions. The counseling center also has a great series of psycho-educational workshops called Discovering Yourself. These take about fifty minutes and the topics range from procrastination, test anxiety, getting good sleep and other useful topics aimed at improving college life. They also offer consultation services to parents, faculty, and staff and they have information on Outreach and Educational programming. For more information on the Counseling Center CLICK HERE. The LGBT Center is a safe space for all individuals. It is our mission to provide support, advocacy, and a sense of community to LGBT* students. Through education, programming, and activism, we heighten campus and community awareness of LGBT* concerns and strive to ensure every individual has equal opportunity to learn, work, and grow in a supportive and safe environment. Stop on in anytime for a free cup of tea and learn more about our community! Laura Schultz is one of the people in charge of the Violence Awareness and Response Program. The program offers confidential advocacy to students who are victims, survivors and intimate partner violence. Legal options are available as well as, reporting on campus, support for emotional struggle and no matter what students are looking to achieve, the center can help them get in touch with the appropriate resources.